Bahir Dar is a city in northwestern Ethiopia, and it is the capital of the Amhara Administrative Region. 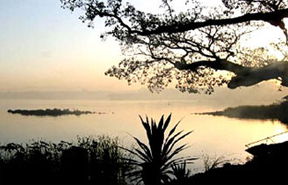 Bahir Dar is situated on the southern shore of Lake T�ana, where local fishermen still use papyrus boats at the source of the Blue Nile (Abay). The city is located approximately 310 km northwest of Addis Ababa, having a latitude and longitude of 11�36'N, 37�23'E and an elevation of 1700m above sea level. Lake T'ana is the largest in the country, covering 2,156 sq km (832 sq mi). It is on the north central plateau of Amhara in the Ethiopian highlands, near Gonder. Lake T'ana is located 1,830 m (6,000 ft) above sea level. 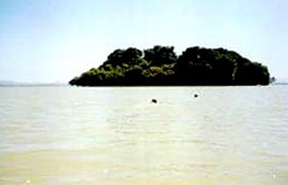 About 85 km (about 53 mi) long and 65 km (41 mi) wide, the lake reaches a depth of about 15 m (about 50 ft). The Blue Nile (Abay) river in northeastern Africa is 1,370 km (850 mi) long. It rises at an altitude of 1,830 m (6,000 ft) in the region of Lake T�ana, in northwestern Ethiopia, flows south and then west in Ethiopia, and follows a northwestern course in Sudan before merging, at Khartoum, with the White Nile to form the Nile proper. The Blue Nile, which contributes about two-thirds of the water of the Nile, is known as the Abbai in Ethiopia, where it, in part, flows through a deep gorge. Tisisat Falls. 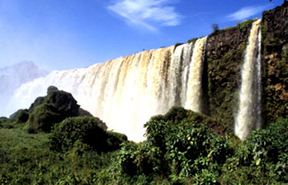 Here the Blue Nile creates "Smoking Water" an awe-inspiring sight as it plunges into the gorge below. 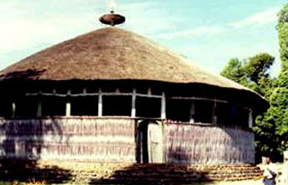 From Bahir Dar one must explore some of the ancient monasteries that have been built on the many islands of Lake Tana. These include Dega Estephanos with its priceless collections of icons, as well as the remains of several medieval Emperors, Kebran Gabriel and Ura Kidane Mehret with its famous frescoes. Kebran Gabriel is the principal monastery visited by male tourists from Bahir Dar, with its impressive Cathedral-like building first built at the end of the 17th century. Dega Estephanos, which is also closed to women, is on an island in the Lake, and the monastery is reached by a very steep and winding path. Although the church is relatively new (only hundred years old), houses a Madonna painted in the 15th century. However, the treasury of the monastery is a prime attraction, with the remains of several Emperors, as well as their robes and jewels. The real historic interest in Dega Estefanos, however, lies in its treasury, se�creted away under a massive antique lock, which is opened with a huge iron key. Here, together with numerous piles of brightly colored ceremonial robes, are the glass-sided coffins containing the mummi�fied remains of several of the former em�perors of Ethiopia. Yekuno Amlak, who re�stored the Solomonic dynasty to the throne in 1270; Dawit, late fourteenth century; Zara Yaqob, fifteenth century; Za Dengel, early seventeenth century; and Fasilidas, also seventeenth century. Near Gorgora, at the northern end of the Lake, the Susneyos palace is a forerunner of the magnificent palaces and castles of Gondar, and dates from the region of Emperor. In the same area, the medieval church of the Debre Sina Mariam is particularly important.